Homepage. This page: Price guide for the Joe Public motorist who needed to value a secondhand car. The Glass' guide to used car prices is a fiercely guarded booklet, eyeballed by used-car dealers up and down the land, and definitely not for public consumption, lest they find out how much mark-up the dealer is putting on their cars. Independent pricing guides, such as Parkers, aim to provide information about used car values to Joe Public today, and back in the 1960s it was the magazine featured here that served to do the same. Priced at 2'6, the Measham Magazine and National Used Car Price Guide was published each month, and combined information on general motoring matters, and an extensive index of 5,000+ used motor-cars, and their estimated values. Featured on the front of the March 1962 issue is the Triumph Herald Estate, a very practical and usable version of Triumph's 2 door car, first launched in 1959. Coincidentally, a Herald also features on the cover of another early-1960s magazine to feature on this site, namely The Motorists' Guide, from 1964. On the first page, the editor grumbles about parking meters and how "We are allowing the parking meter, with the flick of a needle, to turn the law-abiding into the near-felons ... There is neither central guidance, nor policy, only a great reluctance to anything but attempt to cure the parking problem with punitive measures...". I wonder what this chap would have made of motoring in the 21st century, with cameras dotted everywhere recording our movements, with mobile phones and Sat Navs also tracking our progress around our uber-regulated highways? Anyway, back to the mag. An important announcement was also heralded on the front page, in that the magazine was to become the "Measham ABC of Used Car Prices" as of April, and would not be available to the general public, only the motor trade, fleet users and other industry bodies. On page 5 the lucky reader is introduced to the angular delights of the Herald Estate, here in 1200cc form. Based on the saloon, the estate featured a beefed up rear (transverse) spring, boxed-in rear chassis extensions (I think he's talking about the outriggers), and a larger tyre size. The estate would go on to be sold as the Courier van, with panelled rear sides, but only for a couple of years. The article suggests that disc brakes could be specified as an option, which I'd not realised - "The brakes are excellent, with the normal 'drum-all-round' arrangement suitable for the normal driver, and the disc available for those who intend to indulge in ultra hard work in this department. Pedal pressure is commendably light." 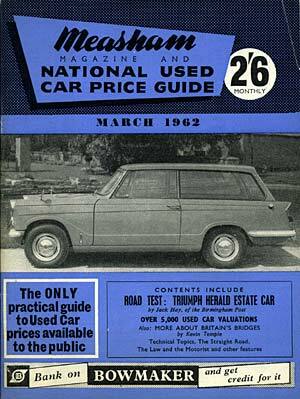 The price of the estate from Standard-Triumph early in 1962 was 547.10s, plus 252.3s.6d in Purchase Tax. Quoted power from the 1147cc engine, fitted with a single Solex carb, was 43bhp (gross) at 4,500 rpm, coupled to a 4 speed gearbox. As mentioned, larger tyres were fitted to this model, namely 5.60x13 tubeless crossplies. Acceleration, 0-60, was completed in a neck-snapping 24.8 seconds, with another 14 seconds required to hit the national 70mph limit. After the Herald feature, the reader will doubtless be engrossed in an article about 'the romance and beauty of our bridges', some of which admittedly can look jolly nice, whereas other, usually concrete, monstrosities look like something out of a 60s communist building programme. Matters motoring are swiftly returned to however, with the World Motor Digest, a column featuring snippets of automotive information from foreign climes - best is probably the following advertisement printed in New York, promoting a range of fall-out shelters and radioactive-proof garages with the guarantee of "Money back if not satisfied!". "Scruffy chassis frames welded up from iron bedsteads and rusted old components, home-made oddities with aero-elastic suspension, and dangerous engine layouts and steering and brake geometry on the part of wild amateurs and low-IQ sports-car dabblers nearly put the whole business of kit-cars out of business. But a few pioneers such as Lotus Cars Ltd., Elva Cars Ltd. and Ashley Laminates Ltd. carried on to prove that you can build a fast, safe, exciting car at home, and gradually the stigma of the word 'Special' died. " The bulk of the magazine though is given over to the price guide, and this can make interesting reading too. How about a 1953 AC Ace for 365 GBP, or a '54 Aceca for 510 GBP in used condition? Depreciation was just as much of an issue as it is today - the P2 Monte Carlo Allard Saloon would have cost 2,568 inc PT in 1952, yet 10 years on would be worth just 185 GBP in top condition, with ropey examples commanding a mere 125 GBP or so. Looking at a car I once owned (an A40 Devon), I can see that in 1952 this model would have cost 717 GBP all in, yet in 1962 the same car might be worth just 165 pounds in splendid order. Really this is the kind of mag that you'd only buy once, when looking to sell or buy a car, rather than a rivetting read that you'd buy every month. The supporting articles are ok, but nothing that you couldn't have found in magazines such as Autocar or Motor, so was really only of use to people eager to value a particular old motor.